Rolling out old characters is a fine line to tread. Sometimes they’re great, and fans welcome them with open arms. Others times there’s an audible groan as people think ‘not this guy again’. 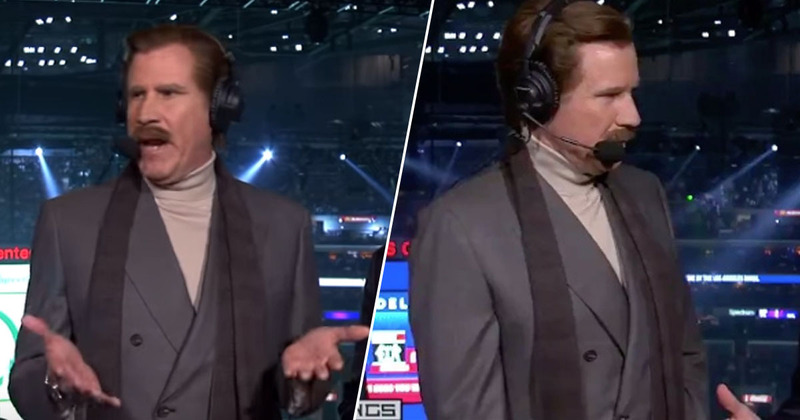 Despite the first film being 15 years old, and the sequel getting on a bit too, Ron Burgundy – for now – still falls into the former, as proved by his recent appearance at an LA Kings ice hockey game. The man behind the moustache, Will Ferrell, is known for being a bit of an LA sports superfan, often seen on the sidelines of USC football games, competing in pre-season baseball games, and now being part-owner of the Los Angeles Football Club. He’s also a huge LA Kings fan, so decided to grace the ice in full character as legendary anchorman Ron Burgundy, turning up during the second period of their game against the San Jose Sharks on Thursday, March 21. As followers of Burgundy will know, he usually sticks to the news coverage, while Champ Kind does the sports stuff. It looks like Ron is branching out now though. As he says himself: ‘When it comes to announcing sports I have zero journalistic integrity’. Still, he gave it a good go. I used to do some [commentating] with the San Diego Gulls in the IHO, of course they were horrible, most of the team didn’t actually have skates. Apparently someone found a corndog in Joe Thornton’s beer during the intermission. I myself feel a little bit nauseous and I hope I don’t throw up during the broadcast, but if I do I’m gonna throw up right on Foxy. I have worn the same lucky underwear for every broadcast I’ve done. I have to keep it together with staples and duct tape, it’s shredded. Well, I used to date Diana Ross, and she dumped me, this was a while ago, and I’ve never let go of it. Bailey brought me this ice-cold cup of milk and guess what – there’s vodka in it. I prefer warm, room-temperature milk. For those of you at home, we’ve had to stop action on the ice several times – feral cats have run onto the ice… Why would the organisation promote bringing stray cats into the Staples Center? Shot on goal! He scores! Put that baby to bed without a diaper!